This seasoning powder, packaged in a resealable jar, is the perfect way to add natural flavour to your dishes.It is great for salads, dressings, dips and cooked dishes, bringing a natural flavour to your cuisine. 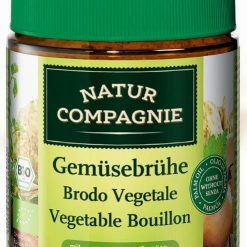 Natur Compagnie sells high-quality organic bouillons that are produced in Germany and Switzerland. The brand was first introduced in 2000, at Biofach, the worldEEs leading trade fair for organic food. The aim was to offer simple and tasty organic products for all.